We have been writing a lot about Coney Island recently. 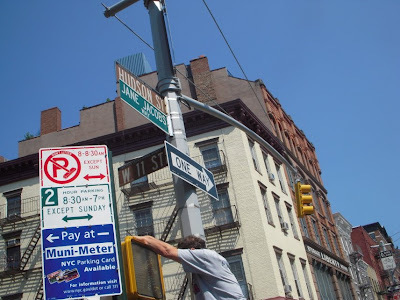 Because of a proposed city rezoning plan, Coney’s fate hangs in the balance. (Your City Council members need to be contacted.) 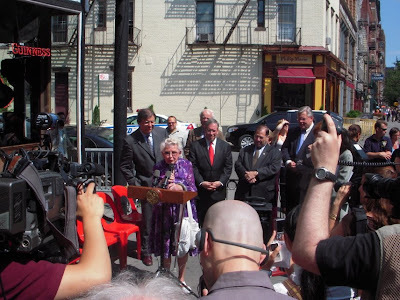 And we have also been keeping up with our Jane Jacobs Report Card Atlantic Yards posts. 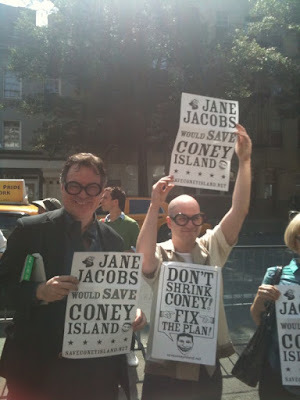 Monday morning Coney Island and Jane Jacobs came together in an event in which we participated. 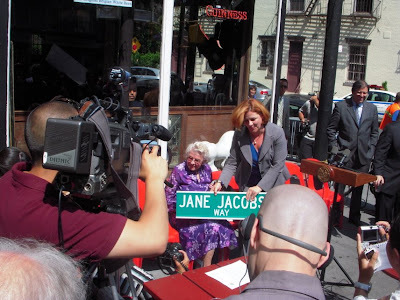 The city picked Monday to dedicate and rename a portion of Hudson Street where she lived “Jane Jacobs Way.” This produced the odd spectacle of politicians, including City Council Speaker Christine Quinn praising community activists and protestors who fight what used to be thought of as Robert Moses-style development, development that is oblivious to communities, their input and their wisdom about their own neighborhoods. These days that style of development is more apt to be thought of as Bloombergian. 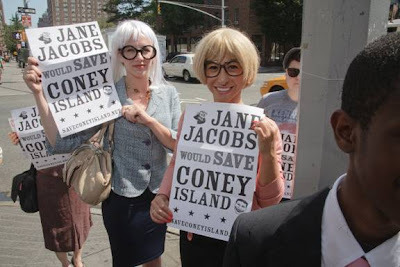 The event also produced protesters, mainly “an army Janes,” protesters who were dressed up as Jane Jacobs and asking that the city plan for Coney Island be fixed. We were one of that group; we wore Jane Jacobs glasses but not a wig. Two YouTube videos of the event are available. 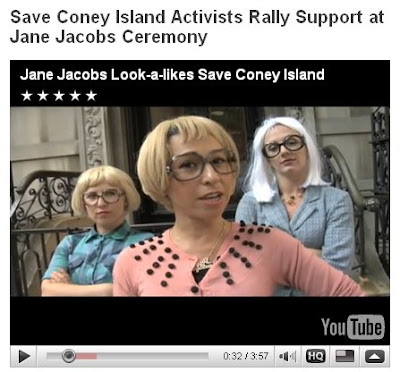 Save Coney Island masterminded the army of Janes and their video is available at their site: Save Coney Island Activists Rally Support at Jane Jacobs Ceremony. In addition, earlier in the day Save Coney Island released a statement from Jane Jacobs’s son, Ned Jacobs, critical of the city plan, saying in part. Let's think first about revitalization successes; they are great and good teachers. They don't result from gigantic plans and show-off projects, in New York or in other cities either. They build up gradually and authentically from diverse human communities; successful city revitalization builds itself on these community foundations, as the community-devised plan 197a does. That is obviously consistent with what her son Ned wrote and could easily apply directly to Coney or to many other large Bloombergian meg-endeavors like Atlantic Yards, Willets Point or the Columbia University’s expansion taking over West Harlem. I will make two predictions with utter confidence. 1. If you follow the community's plan you will harvest a success. 2. If you follow the proposal before you today, you will maybe enrich a few heedless and ignorant developers, but at the cost of an ugly and intractable mistake. Even the presumed beneficiaries of this misuse of governmental powers, the developers and financiers of luxury towers, may not benefit; misused environments are not good long-term economic bets. Come on, do the right thing. The community really does know best. Besides the army of Jane look-alikes present in their attempt to rescue Coney Island, Suzannah B. Troy was also there to protest and quickly produced yet another video in an energetically heartfelt series of videos she has produced opposing “King Bloomberg” and Ms. Quinn, who assists him by passing administration-backed development proposals. 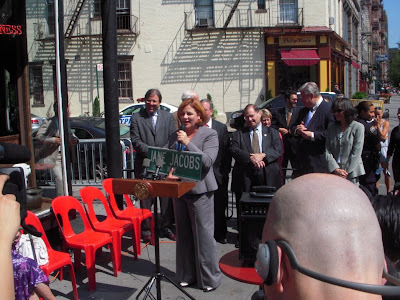 Ms. Troy’s sentiments are clear from the title of her video: Protesting Christine Quinn at Jane Jacobs' street naming, Jane must be turning over in her grave! 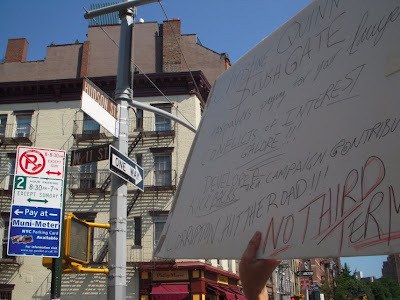 Jane Jacobs was not in favor of ad hominem attacks, but when it comes to city development issues we can't think of anyt where Quinn (or Bloomberg, from whom she is inseparable) has been on the right side. We also haven't seen that the inseparable pair are actually open to compromise as opposed to feigning that they are. Anyway, in terms of getting necessary messages across ad hominemism seems increasingly efficient when it comes to Quinn and Bloomberg. In this though we can’t speak for the Save Coney Island group, only for ourselves. We know the Save Coney Island people have their hopes about Ms. Quinn. Closer to her political home on Manhattan’s West Side, Ms. Quinn had been helpful in pushing through a sell-off of a portion of the Greenwich Village Historic District in order to subsidize a large new St. Vincent’s Hospital that also involves an exceptionally large new residential building being developed by the Rudin organization. Also, Chelsea Now says the community is complaining about the mounding up of extra density at “Himalayan” Hudson Yards. (See: Hudson Yards 'Himalayas' earn public ire at forum, Thursday, June 18, 2009, by Diane Vacca.) Not only is a great deal of extra density being put on that site but consider this for an example of how the Bloomberg administration wants to have its cake and eat it too: Notwithstanding the already extreme density of Hudson Yards, the Bloombergian Department of Housing, Preservation and Development is proposing to have the developer go off-site, outside the project footprint, to provide the assocaited affordable housing the community wants (at two off-site locations) but only if an additional zoning change is put through also up the density of the other sites as well. Will Quinn Detect That People Are Getting Fed up and Change Course? We have recently seen a great deal of the grass roots anger being directed toward Quinn. For instance, there is another YouTube labor-of-love video we came across recently done by Donny Moss that catalogues Quinn’s misdeeds and deceptions with particular focus on her betrayals with respect to the lesbian and gay community: Christine Quinn: Behind the Smile. We think that a lot of the anger being directed at Quinn now is earned by reason of her constant support for Bloomberg, particularly his Bloombergian style of development. Robert Moses, move over. Will Quinn modify her behavior now that she is faced with a primary? She has two opponents for her 3rd district City Council seat: Maria Passannante-Derr and Yetta Kurland. We don’t know much about them yet, though if one of them is going to win it would be advisable for them not to engage in vote splitting. Does Ms. Quinn feel vulnerable enough to start changing course? There is this primary and then, of course, she also wants to be mayor. Were it not for the term limits extension she would be running for mayor now, but the extension worked out well for her given the timing of her slush fund scandal. The deadline for the City Council to fix the city plan is about to expire unless procedural maneuvers can briefly extend it. If the City Council under Quinn doesn’t act to fix that plan then Quinn’s Council ought to scrap the plan entirely. Coney Island will provide an interesting test of whether Ms. Quinn will be changing course. Ms. Quinn clearly acknowledges that she heard the community’s request to fix the plan and knows the phone calls are flooding in. The question is whether she cares what the community wants if that’s not what the mayor wants. I am a volunteer with Save Coney Island. The city claims they are revitalizing the area but their plan would devastate Coney Island as an amusement destination. Shrinking the area zoned for amusements from 60 acres to 9 or 12 to make way for corporate retail and high rises will kill Coney for good. What is left after the bulldozers come will not survive because the area will not be large enough to draw the big crowds necessary to make an amusement area profitable. Coney Island currently attracts millions of visitors a year who seek fun, nostalgia, and the beach. They do not come for high end shopping or to admire the architecture of a luxury condo. If the area is shrunk again by the city to such a small degree it is only a matter of time before it disappears for good. Coney can be a very profitable very viable tourist destination if handled correctly but for some reason the city has never been interested in that. The city has always preferred to evict rides in favor of some other scheme (horribly managed projects, an abandoned ice rink, casinos that never came to be, luxury condos etc.) In the past, these grand plans have always resulted in a loss of amusements and jobs for the creation of empty lots and deteriorating/abandoned structures. Don't let it happen again. The resilience of Coney's remaining amusements is a testament to the appeal of Coney Island as an amusement area. Tell the city to retain the existing amusement area and build whatever else in the many empty lots they created over the past 5 decades. Call City Council and tell them to FIX THE PLAN - DON'T SHRINK CONEY!!!!!! Then be sure to call your local councilmember and tell them too!!!! Go to this link and plug in your zip code to find out who your councilman is! Then tell them FIX THE PLAN!!!!! I think this may be the first time I have seen anyone donning white wigs and black rim glasses to evoke Jane Jacobs to make a statement. How wonderful and theatrical. I'm author of the book "Wrestling with Moses: How Jane Jacobs Took on New York's Master Builder and Transformed the American City" (Random House). I have my own blog "Developing Stories" and my website is www.anthonyflint.net. I'm a former reporter for The Boston Globe. Your stuff is great journalism. Wow, great coverage. Someone just sent me the link and I added to my youtube and blogs. My newest youtube calls for the term limits votes to be tossed out because I have counted 5 city council members so far tainted by corruption that had voted to extend term limits! Will Thompson Kick It Off Right In Brooklyn?